Finding a good dog kennel facility is of utmost importance, which means that it should conform to good cleanliness standards and trained and qualified staff to attend to the boarding dog is mandatory. Make sure the facility has a lot of natural sunlight coming in and an attached yard with fencing is necessary for the dog to get some exercise running around. Most dogs don't like to be caged inside all the time and will resist such dog kennels in time. Ensure that the sleeping quarters' of the boarding dog is cleaned out each time the dog has a bowel movement as well as routine cleaning procedures should be carried out. Do not compromise on quality thinking the cost is low because there are chances of your dog going into a dog kennel facility which is undermanaged with few staff that spends all their time cleaning with no time to take the boarding dog on a run or some fresh air. If left unattended in a dog boarding kennel, there are chances for your dog to become depressed and lethargic which could be detrimental to the mental health of the dog. Also, try not to put your dog in a crammed dog kennel where it's exceptionally noisy making the dog stressed out. Such stressed out boarding dogs abstain from eating and playing and could end up being ill.
Find out whether a vet is on call at the dog boarding kennel to attend to the boarding dogs in case of injury or illness. The dietary needs of the dog should be carefully attended to and it is preferable if they are willing to accept the food you provide for your dog. Some dog kennels provide special grooming services at an extra cost. Up market places have spa treatments and special shampoo washes which would give a total makeover for your dog. 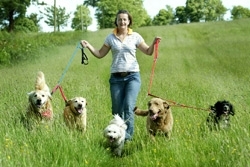 Some dog boarding kennels make arrangements for pick up and drop of boarding dogs. 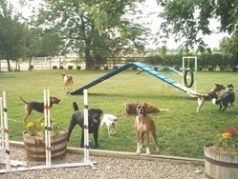 Training sessions with professional trainers can also be roped in during the stay at the dog kennel. If the dog boarding kennel is strict about providing proofs of vaccination, medication the dog is taking etc, it only shows that the particular centre is conscientious about these factors and you can rest assured that your dog is going into a responsible environment.